The Mahachanok (or Maha Chanok) (Thai มหาชนก) mango is a cultivar of mango grown primarily in Thailand. This mango is a hybrid of Sunset and Nang Klawan. It is also grown in Australia. 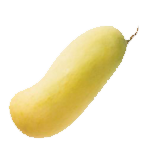 Mahachanok mango is very elongated and curved, with a typical weight between 250 and 370 grams. It turns yellowish–orange with pink blush when ripe, and is one of the most popular varieties in Thailand for eating ripe (as opposed to green).